What's the Best Time To Start Your Family Business Succession Planning? When is the best time to hand over the reigns? Perhaps its not something you like to think about. That is natural enough. However, when it comes to family business succession planning, the earlier the better. Grooming future leadership is a process that takes time and preparation. According to the Washington Post, almost 33 percent of the American workforce, including 48 percent of our supervisors will be eligible to retire this year. Furthermore, it’s estimated that for the next 19 years, approximately 10,000 baby boomers will retire EVERY single day! During the upcoming years, the need to replace senior managers as well as company founders will be a daunting task. And even though most business owner’s value family business succession planning, passing the baton to the next generation and making it seamless isn’t always a piece of cake. Handing over a business from one generation to another can make or break a business. Far too many business owners wait until there’s a health crisis or other unforeseen financial circumstances before they relinquish control. Waiting too long to engage family business succession planning often jeopardizes the hand over transaction, and in many cases puts companies at undue risk. A recent business survey conducted by PwC identified three gaps that families need to bridge to effectively transition ownership and control to the next generation. The Generation Gap: The world has dramatically changed over the past 30 years. Many next generation leaders feel the need to introduce better governance, technology and more systematic processes. Caution: changes should be introduced slowly. Making too many changes too quickly can affect consumer and employee confidence. The Authority Gap: 88 percent of next generation leaders feel a need to “prove themselves” in order to gain the respect of customers and co-workers. These days it’s important for next generation leaders to establish credibility elsewhere first. It’s best to create a structured succession plan where the successor gains a higher education and works elsewhere to experience failure and success first. The Communications Gap: It’s not easy for business owners to turn over control. Older generations must realize that their role will change from controller to supporter and influencer. For a smoother transition, consider developing clear roles and shift your responsibilities to become a facilitator and to communicate openly and honestly throughout the transition. The key to success is to hand over the reins at the right time. Poor family business succession planning and badly drafted transactions are problematic for family businesses; as with the Malkin Family (owners of one of the America’s most recognized landmarks, The Empire State Building). For the past two years, the controlling Malkin Family has been inundated with financial challenges due a complicated ownership structure. The ability to effectively manage succession is the key to a business’ long term success. To avoid family feuds, I recommend that you begin early enough so that both generations are capable of rationalizing the details of the hand over transaction, and knowing what is expected, so no opportunities are wasted. 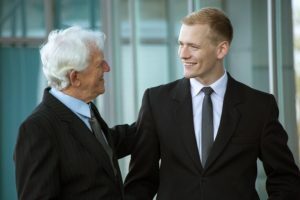 It’s always better to deal with family business succession succession planning while the older generation is still in good health. Operational duties should be handed over gradually, so that both generations can work together to develop support systems that will aid in the company’s transition. This also gives the next generation successor added time to learn about the ins and outs of the business and its customers before assuming full control.